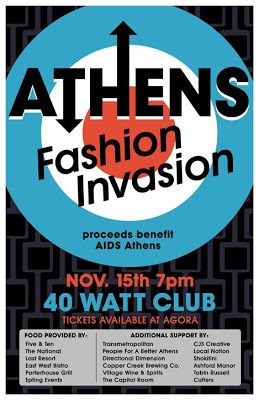 On November 15th, well-known vintage shop Agora on East Clayton St. presents the&nbsp;"Athens Fashion Invasion" at the 40 Watt Club on East Hancock St., with all proceeds&nbsp;benefiting&nbsp;AIDS Athens. The night will celebrate a variety of businesses: salons, restaurants, and fashion by local boutiques. Doors open at 7 p.m., show starts at 8!&nbsp; Admission is $12. Agora owner Airee Hong said, "I wanted to celebrate the local&nbsp;businesses&nbsp;that make Athens so great and this is a way they can. The local salons do so much with hair shows. We approached some of the best known&nbsp;restaurants&nbsp;in Athens like Last Resort, 5 &amp; 10 and Porterhouse so they could sponsor food. But&nbsp;more important, we&apos;re doing this all for charity.&nbsp;Everyone will have a great night and a huge dance party at the end. It&apos;s totally Athens style." Expect a fashion show contributed by&nbsp;Heery&apos;s, Suska, Community, Flirt Fashions, Dynamite, Showpony, Frontier, Whole: Mind. Body. Art., and Agora. Enjoy the tastings of 5&amp;10, The National, The Last Resort Grill, Porterhouse Grill, Epting Events, East West Bistro. Sponsored by: Boybutante, Local Notion, CJS Creative, Directional Dimensions, Transmetropolitan, Village Wine &amp; Spirits, Cutter&apos;s, Capitol Room, Shokitini, Ashford Manor, Copper Creek. Get Your Tickets here&nbsp;or purchase them at Agora! "Bringing people together for a great cause... that&apos;s what Athens is all about."